QUESTION: Why is it that 12-year old kids can create and execute inspired football plays, while executives around the world fumble innovation? ANSWER: The kids know their game; the executives do not. The kids know the goals. They know the rules. They have a deeply consistent and richly expressive vocabulary for football. Most important, their knowledge is shared. When the kids say "take five steps and buttonhook to the left," everyone understands. Meanwhile, in the land of innovation, Babel ensues. No three executives agree on what, precisely, innovation is . . . or how it is done. There isn't a compelling, comprehensive theory. The vocabulary is mush. Muted by our confusion, we fall on the ball or throw the Hail Mary. Few can run the "buttonhook" in the game of innovation. OBSERVATION #1: Millions of everyday people are able to master the incredibly complex game of American football because the key concepts have been elegantly articulated in documents such as the NFL's exceptional "Beginner's Guide to Football." OBSERVATION #2: If the community of innovation theorists and practitioners could provide a similarly elegant "Beginner's Guide to Innovation," it could empower millions of individuals and organizations to engage and eventually master innovation. To that end, I am publishing this first draft of a "Beginner's Guide to Innovation" with hopes of seeding an effort to create a 1–3 page document that organizations around the world could use as an introductory training document and reference guide for all employees. The goal of innovation is to create value for one or more of your organization's stakeholders (e.g. customers, investors, employees) by changing one or more of the components of your organization. The following diagram represents the essential components of any organization. The degree of business risk typically goes up as you move from Level 1 (mojo innovation) to Level 4 (mission innovation). While the basic process of innovation is the same across all levels, there are discrete techniques that are applied at each level. 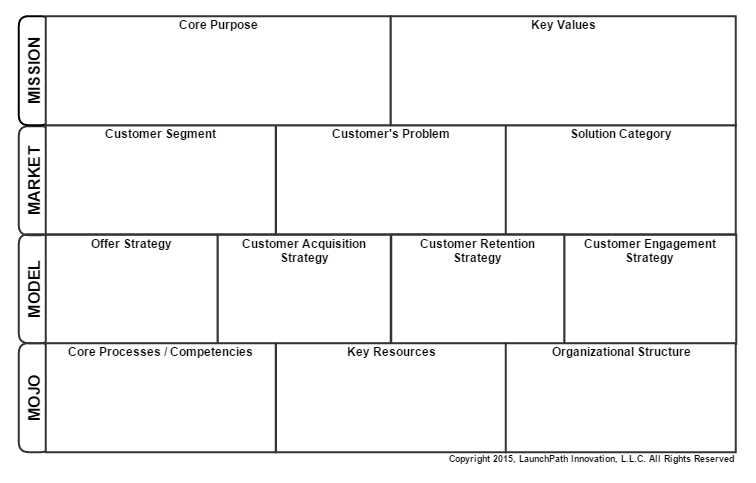 For example, value stream mapping is a common innovation technique that is applied at the mojo layer whereas business model canvases are commonly applied at the market and mission layer. When you make an innovation at one level, it may require changes to one or more components at all lower levels. IMPORTANT NOTE: Innovation at a higher level is not necessarily "better" or more "disruptive" than other forms of innovation. For example, the introduction of the shipping container increased the capacity of the worldwide shipping industry by 4X even though it was a relatively simple Level 1 innovation. ARTICULATE - Flesh out the key assumptions undergirding the idea and identify the relative risk of each. TEST & ADAPT - Scientifically test the high-risk assumptions using prototypes, smoke tests, and other low-cost "minimum viable products" (MVP). If the tests validate your assumptions, move forward. If the tests invalidate your assumptions, consider whether or not you can productively adapt (pivot) the idea to your new understanding of reality and re-test. INTEGRATE / SPIN-OFF - Once all key assumptions of the idea have been validated and verified, integrate the innovation into the standard operations of the organization or spin-off as a separate entity.